Genting group is a company that is quite diversified. The Malaysian company has casinos, the worlds largest hotel, a real estate company, a plantation company, several cruise lines and a shipyard consortium. The intention is to build the fifth largest cruise ship for Genting’s Star Cruises Global-class at Genting’s MV Werften shipyard. The Kuala Lumpur based company is pumping a ton of money into their cruise sector including pumping hundreds of millions of Euros into the yards to enable them to build large ships. Amongst the challenges that come with that are the significant increase to the number of workers needed. And along with that is the need to house those workers. To solve that, the SuperStar Libra (ex-Seaward, Norwegian Sea) from her service with Gentings Star Cruises in India and they will moor her at at the Wismar yard to provide accommodation for those workers. The yards that build the Oasis-class, Quantum-class, Excellence-class and Meraviglia-classes are all gigantic yards that have a longstanding history in shipbuilding. STX France actually has one of the largest drydocks in Europe. A new addition to those extra-large ships will be Star Cruises Global-class. This ship will be built at the newly formed MV Werften yards. The 204,000gt ship will be 1,122ft long. These ships are going to be massive. 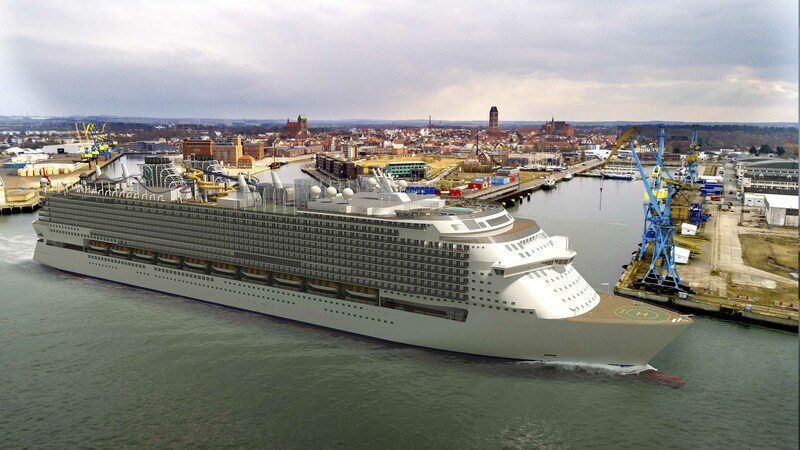 So big that it will take yards both in Rostock and Wismar to build it. (The last large ship that was built in two and then assembled at one was Disney Magic at Fincantieri). The Global-class is a ship twice the size being built at a yard that has no mega ship experience. I have a good breakdown here of what we can expect to be seen onboard this vessel. I fear they may have bitten off more than they could chew but time will tell. What will be crucial for them will be the milestones. They already started cutting the steel and next will be the coin ceremony and then the float out of the sections. You can be assured that I will be following this closely and posting updates to the site. Stay tuned!